As part of our 90th anniversary celebration back in 2010 and to promote communication between members by radio, a new society operating achievement award was introduced on the 1st June 2010, initially for a period of one month. This award proved so successful in stimulating on air communication between members, we have decided to make it available until further notice. All points earned from the initial one month period can be added to those from new contacts to accumulate sufficient points to apply for the Double Sapphire Award in one of the two available classes. The Double Sapphire Award itself is in the form of a skillfully crafted certificate and is available in two classes. Contacts allowed from 00.01 UTC 1st June 2010. Award open to all members of the Society, i.e. those whose subscription covers the year that the QSO (contact) was made. 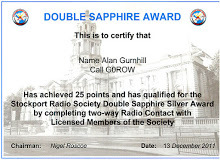 Contacting a SRS club callsign – GX/G3LX, GX/G6UQ, GX/G8SRS and MX/M5MDX – scores-5 points each. Contacting the Society President G0ROW – also scores – 5 points. The President is classed for this award only, as a club call. Silver – 25 members or 20 members +1 society callsign, or 15 members + 2 society callsigns, or 10 members + 3 society callsigns = 25 points any mode any band and only current call being used. Gold – a further 25 members or 20 members + 1 society callsign, or 15 members + 2 society callsigns, or 10 members + 3 society callsigns = 25 points. (25 silver points + 25 gold points = Total 50 Points) any mode, any band, and you can work any member or club call again in this section as long as it is not on the same band as it was worked on in the silver section, and again only current call to be used. For members who are SWL – we have now setup a system for you to win a Double Sapphire Award aswell. Please see below the rules, sample certificate and the Claim forms. If you have any queries please speak to Alan G0ROW at any club meeting.